Balkrishan Gopiram Goenka, the vice chairman and managing director of the Welspun Group, has drastically altered its profile over the past few years by making Welspun Gujarat—a part of the $3-billion Welspun Group and the second-largest manufacturer of large-diameter pipes in the world—the growth spearhead. A report by Anand Adhikari. They’ve dubbed it ‘Project Nipun 2012’. In a 9th floor office of Trade World in the Kamala Mills Compound in Central Mumbai, representatives of the UK-headquartered Hay Group, a 60-year-old human resources consultancy, are attempting to help an organisation come to terms with its rapid growth. Over the past few years, the company in question has been galloping along at growth rates of over 100 per cent in both revenues and profits. That pace of growth is expected to sustain over the next three years. The challenge for this 12-year-old corporation? To create a bench strength of leaders and managers, along with an organisational structure, to aid in transforming the business from a singleproduct, single-location set-up into one that produces multiple products across global locations. In essence: to align the business and work processes with increasing growth, scale and complexity (Hay Group recently concluded a similar exercise at the petrochemicals business of Mukesh Ambani’s Reliance Industries). The company in question is Welspun Gujarat Stahl Rohren, a part of the $3-billion (Rs 12,900 crore) Welspun Group. Welspun Gujarat is the second-largest manufacturer of large-diameter pipes in the world, with energy giants such as Chevron, Shell, Bechtel and Exxon Mobil on its client list. Its 42-year-old promoter, Balkrishan Gopiram Goenka, Vice Chairman & Managing Director of the group, owns 42 per cent of the company’s equity. Traditionally, a textiles-oriented group, with interests in yarn, home furnishings and bathrobes, Goenka has drastically altered the profile of the group over the past few years by making Welspun Gujarat the growth spearhead. Consider: in 2002, it had a profit of just Rs 1.5 crore compared to the Rs 18-crore profit for the home textiles flagship at that time, Welspun India. Four years later, the pipes maker’s bottom line was over three times larger than that of Welspun India—Rs 142 crore as against just Rs 45 crore. BKG (as he is called by insiders) is pleased as punch, but he clearly isn’t taking sides when it comes to his bouquet of businesses. 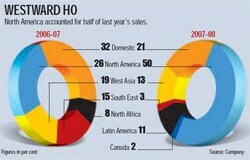 “The numbers may tell you a different story, but we are equally committed to all our businesses. For instance, we have set high targets for our textiles businesses,” he points out. Doubtless, though, Welspun Gujarat is the group’s cash cow— raking in profits of close to Rs 350 crore in 2007-08. And if Goenka is stepping on the accelerator, he’s able to do so thanks to the well-oiled growth engine that the pipe maker is proving to be. If the entire group today has revenues of approximately $3 billion, Goenka hopes to make Welspun Gujarat itself a $2-billion (Rs 8,600 crore) company by 2010. Overseas orders are flowing thick and fast—today the company sells more globally than in the domestic market—even as huge demand is expected from India especially from oil & gas players like GAIL, Cairn and Reliance. “We already have orders worth Rs 5,000 crore to be executed in the next one year,” says Goenka. If Goenka is also gung-ho on the domestic market, it’s because of the massive investment of $20-25 billion (Rs 86,000-1,07,500 crore) that’s expected to be sunk in oil & gas exploration and production by 2012. Reliance alone will pump over $10 billion (Rs 43,000 crore) over the next two-to-three years in exploration activities. To meet the growing demand, Welspun Gujarat is increasing capacity from 1 million tonnes per annum (TPA) to 1.75 million TPA by March 2009. In order to get closer to its global clients, Goenka recently set up a pipe manufacturing facility in the US. This facility will not only bring down its freight cost by nearly $100 (Rs 4,300) per tonne, it will also help Welspun come closer to the customer. “We have large landholdings in the US that offer scope for expansion there. 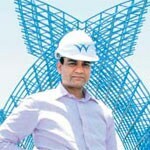 We can easily do a million-tonne plant in the US,” says Akhil Jindal, President, Welspun Group. Welspun is eyeing the huge replacement market in the US. That’s because 1 million miles of gas pipeline out of 1.5 million miles is pre-1975. To gain more control over the production process, Welspun Gujarat has integrated backward, from pipes to steel plates (which are needed to make the pipes). A 1.5-million tonnes per annum plate mill at Anjar in Gujarat has been up and running from April this year. This venture gives the company a tighter control over costs and also improves its flexibility to ship orders fast (as raw material suppliers often take 6-12 months to deliver plates). Moreover, it will help Welspun protect itself from fluctuations in steel prices. The integration doesn’t end there. Goenka hopes to put in play a closely-held group company, Welspun Power & Steel, which will provide the steel to make the plates. The five-year-old company is exploring the possibility of setting up a 3.2-million tonne plant for specialty steel, which will cater solely to the pipe manufacturing unit. The cost of setting up this plant would be Rs 5,000-6,000 crore. “The plant may go on stream in the next three years,” says Goenka. Today, Welspun Power & Steel has a capacity of 2 lakh tonnes of sponge iron and bars, a turnover of Rs 400 crore and earnings before interest, taxes, depreciation & amortisation (EBITDA) of Rs 100 crore. The investments planned make this company a candidate for an initial public offering. The pipes business is Goenka’s trump card, but it isn’t stopping him from plotting strategies in other high-growth areas. One such foray is real estate. The group has a land bank of 1,000 acres, which it plans to develop over the next two-to-four years. The landholdings are in Gurgaon, Kalyan, Talashi and in and around Gujarat. “We also have a 50:50 JV with Alok Industries. There are also two SEZs—for engineering and textiles— covering an area of 600 acres at Anjar,” says Jindal. Another foray is retail. Goenka’s youngest venture, Welspun Retail, which is managed by his wife Dipali Goenka, is gradually expanding its retail footprints in smaller cities to exploit the Rs 10,000-crore market for home furnishings. However, the organised players control only 2 per cent of this pie. Dipali Goenka, Director, Welspun Retail, is doing her bit to change things. Her aggressive plans include having 600 stores and a turnover of Rs 1,000 crore by 2011. The company has sales of Rs 250-300 crore, and it expects to break even soon. Welspun has also added international brands like Christy of the UK and Sorema of Portugal in its bouquet of offerings. Christy, for instance, is the UK’s biggest towel and bedlinen brand. The 110 Christy stores in the UK now also stock Welspun products and the Indian stores, too, will soon have Christy and Sorema on their shelves. Welspun has been able to turn around the loss-making Christy business by stopping highcost production (the company has a top line of Rs 400 crore and an EBITDA of Rs 22 crore). Earlier, Christy used to outsource close to 70 per cent of its requirement from low-cost production centres like Turkey and the remaining 30 per cent used to come from its Manchester facility. After Welspun took it over, that 30 per cent has since shifted to India. Yet another acquisition was of Sorema, a maker of bath rugs and shower curtains. Chirsty and Sorema, along with Welspun’s own and licensed brands like Nautica and Umbra, give the company a complete portfolio of home textiles brands. These complement the traditional business of towels and bed linen under Welspun India, which Goenka hopes to take up to $1 billion (Rs 4,300 crore) in revenues by 2010. Clearly, for Goenka, growth is an obsession, and he’s got a fistful of opportunities to help him in that endeavour. Now, he needs to build an able band of managers and leaders to execute those growth avenues.